On March 9, the FOTOHOF gallery will present the first exhibition of the British photographer Simon Roberts in Austria. Simon Roberts is one of the most prolific and internationally renowned photographers of the contemporary British photography scene, who has spent the past 10 years tracing the "British". The exhibition in Salzburg is titled Landscape Studies of a Small Island, the beginning of an international exhibition tour of this work. In 2004, Simon Roberts set out on a twelve-month trip through Russia to create a photographic portrait of this nation, which he knew only through the fictional, clichéd images of the Russian landscape and the images of the sociopolitical crisis from the mass media. The resulting book Motherland documents the places and people whom Simon Roberts encountered during this journey, during which he moved as an outsider through a foreign country. On his return to England, Roberts began to deal with the question of what it means to be British and decided to focus his camera on his own country, the British and their landscape. The result is a series of several works showing the political, social and cultural British landscape We English, The Election Project and Pierdom will be shown in the Fotohof under the title of Landscape Studies of a Small Island. The first major work that followed the Russian Motherland project was on a one-year trip across England, Simon Roberts sharing with his family in a camper. The We We series consists of 56 large-format photographs that trace the social and cultural signs and signs of what it means to be British. The camper was more than just a means of transportation, it became an integral part of Roberts work, as the increased perspective created the possibilityof an unusually high viewpoint. Not aerial photographs, more like looking into a museum cabinet. Roberts always maintains a reasonable distance; the people in the center of the image fit into the landscape as if they were in a stage design. Non-judgmental and free of irony, his photographs provide evidence and information about social relations not only between people, but also between people and the places of their leisure activities in the English countryside. Simon Roberts's longstanding engagement with the British identity led to the 30th Olympic Summer Games 2012 in London, where he was the only artist to have permission to photograph. Immediately after the publication of We English, Simon Roberts was commissioned to document the election campaign for the British Parliamentary Elections in May 2010 and to tour the country again as a "British Election Artist 2010" in a mobile home. For the first time, a photographer was selected for the role of the "election artist". Robert's freshly completed work We English offered the perfect starting point to continue his critical observations of the country, focusing on the political upheavals that moved the country. Again, from the slightly elevated perspective of his motor-home, Roberts followed the unprecedented variety of political parties in his country, but also the profane reality of the election campaign. He also documented the smaller, independent candidates who were acting outside mainstream press coverage. As a continuation of the election project, the exhibition also features pictures from his latest work Let This Be A Sign, a study of the economic impact of the savings policy on the British landscape. Because of his continued interest in the political events, he took up the Brexit phenomenon and shows new photography as current contributions to this socially and politically highly explosive topic. In his third work on Great Britain, he draws his attention to the landmark of British leisure, the sea. Instead of crossing the island, Roberts followed the coastline. 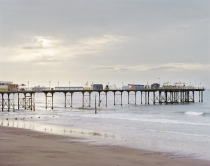 For Pierdom, he traveled the "edge of Great Britain" and documented all 58 piers in the bathing and coastal resorts of Great Britain. These relics of architectural expressions of the working class faded long after their Victorian bloom and are for the most part abandoned. Roberts avoids romantic looks at the piers, and once again puts that into a broad context, which means being British. He takes a step back and directs his large-format camera onto the landscape to show us the many and undefinable facets of the British. Simon Roberts, *1974 in London; lives and works in Brighton. Press photos may be reproduced free of charge in conjunction with an exhibition notification or review.